The officials from Guangdong province bought the bodies from a man who stole more than 20 in night-time raids on graveyards, the official news agency Xinhua said, citing Chinese media. "Both were local officials in charge of funeral management reform," said Xinhua, naming them He and Dong. "They told police that they bought the corpses to finish government cremation quota," it said, adding that Dong had paid 3,000 yuan ($484) each for 10 bodies, while He's cost half the price for an unspecified number. China has a long history of ancestor worship, and in many areas a traditional belief that an intact body is necessary for a peaceful afterlife, so that burials are preferred and families are keen to build tombs for their loved ones. But the government has launched a campaign encouraging cremation to save land for farming and development. The bodysnatching scheme went up in smoke in June when a man in Beiliu in the Guangxi region, next to Guangdong in southern China, reported his grandfather's body had been stolen, the Xinhua report late Sunday said. The family had been guarding the tomb in a bid to ward off potential grave robbers, but could not prevent the theft, Xinhua said. Authorities had demanded a minimum number of cremations in the unspecified towns where Dong and He worked, but residents had begun burying dead relatives in secret to bypass the regulations. "Pushed to meet their quota, the two officials sought to purchase the corpses and send them to funeral parlour for cremation," Xinhua said. China's drive to see more deceased people cremated rather than buried has been widely opposed across the country. Six elderly people in the eastern province of Anhui province were said by domestic media in May to have committed suicide to ensure they died before new regulations banning coffin burials come into force, domestic media reported in May. 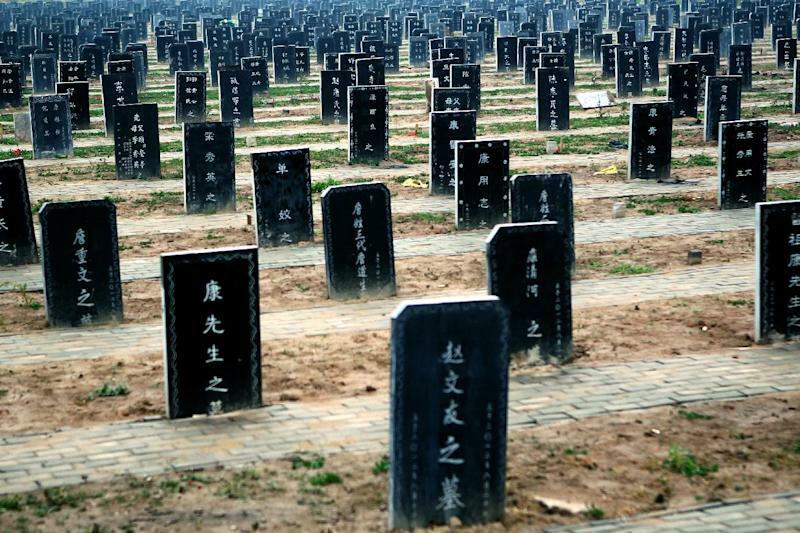 Officials elsewhere have launched massive campaigns to "flatten graves" to create land for farming and development, with 400,000 graves demolished in the central province of Henan in 2012, according to reports, provoking a nationwide outcry.